Sometimes battling celiac disease is really, really, hard. Like, I have to eat five different types of cupcakes, hard. I know! You are so glad you aren’t me, right? I know cupcakes are on the downhill slide of trendiness, but I was cupcake before cupcake was cool. In fact, I’m pretty sure there’s a picture of me on my third birthday chowing down on yellow cupcakes with chocolate frosting. Take that, trend-setters. And that is why I’ve been searching for a magic gluten-free cupcake for the last six months. Guess what, readers? I’ve found some. Woot! I’m the person that came out of anesthesia and announced to my GI doc that I would be eating a Magnolia cupcake at least once a year, probably on my birthday. He totally shut me down, and I realize now it was for my own good. I mean, who wants to spend their birthday in the toilet? After you’re well out of your 20s, anyway. So I bravely went to Babycakes, in downtown LA. I picked up every option at Whole Foods, Erewhon, Trader Joe’s (actually, Trader Joe’s just has brownies. Need to step it up, TJ), and finally found not one, but two cupcakes worth freaking out about. The best gluten-free cupcakes, that money can buy and you don’t have to make yourself, are . 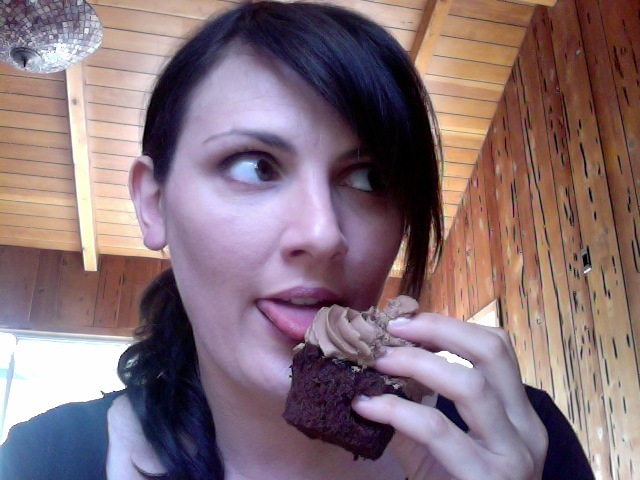 . .
You can see me licking a chocolate gf cupcake all over in the photo above (that’s a nice photo, don’t ya’ think? ), but really it’s the vanilla ones that rocked my world. The icing was especially delightful and it reminded me of my favorite bakery in Brooklyn; One Girl Cookie. Since geography and gluten will keep me away from One Girl, I’ll be picking up my sweets from The Sensitive Baker in Culver City from now on. Let’s hope they’re able to expand all over the place so you, too can enjoy a light, fluffy, cupcake with an icing as addictive as those croissant pretzels from City Bakery. Which will also never cross my lips again. Jerks. Oh my, do I love the baked goods from Almond Glory. As you might have guessed, the secret ingredient is almond flour so you’ve gotta’ love that nut. I do, and these flavorful cupcakes really hit the right sweet spot. The cupcakes and cookie bars also get points for not trying to replicate the traditional cupcake, but creating a unique flavor all their own. YUM. Babycakes — I actually don’t like Babycakes, but everyone else seems to including my husband, who loved the dense vegan cupcake. And he’s neither gluten sensitive, nor a vegan. Huh. Whole Foods Bakery — These will do in a pinch. Like if you have to provide a bunch of cupcakes to your kid’s school birthday party, or you haven’t had a cupcake in so long you think you might die if you don’t shove one down your gullet right now. Let me know gf peeps, where do you get your cupcake on? Tags: gluten free diet, gluten free junk food, gluten-free cupcake, gluten-free products. Bookmark the permalink. You don’t like babycakes??? I’m scratching my head right now. Okay, I’m done. Did you try their donuts??? Oh yum. For chocolate cupcakes, try Katz Gluten Free. Moist, dense, I can’t remember if I let it fully defrost. But it was ALL That Good. Oooh, where do you find them? Do I need to order them online? ‘Cuz I’ll do it. I have done the Whole Foods thing because I think that’s all that’s available to me. I am now a proud owner of a copy of The Cake Mix Doctor Bakes Gluten-Free, and I’m dying to try every single recipe. The woman is a chemist of the kitchen. She did a g-free book? I was just about to try one with a gluten-free cake mix that my husband loves! Super exciting. Thanks for the info, Jen. Whole Foods is a great option, but not your only option. There are many other products and brands available that will satisfy your sweet tooth. I didn’t like babycakes cupcakes either… but I loved the donuts. And the cookies. Sprinkles does an AMAZING gf red velvet, but just red velvet. And if you ever get down to San Diego on a day trip, there’s an AMAZING place here called cupcakes squared. (In fact, SD is easier overall for gf; I’m back and forth from SD to the Cerritos area every other weekend, and it’s SO much easier to eat in SD.) I’ve tried to go to the Sensitive Baker a couple of times; I never can get there when they are open! Okay, then I’ve GOT to get back to Babycakes and check out the donuts. I’ve never been to Sprinkles! And I literally just got back from San Diego without knowing about Cupcakes Squared! But I’ll def check it out the next time I’m there. Yeah, Sensitive Baker rules, so I’m wishing you luck the next time you’re in LA!